Every year I can't wait for Super Bowl Sunday, not only because I love to watch an exciting football game between two of the season's best teams, but also because of the fabulous greasy food that is always served at every Super Bowl party. I love to pile my plate full of loaded cheesy nachos, crispy french fries with vinegar, spicy chicken wings with creamy dipping sauces, and slices of gooey pizza covered in pepperoni. Now, you can imagine my disappointment this year because I am trying to eat healthier. 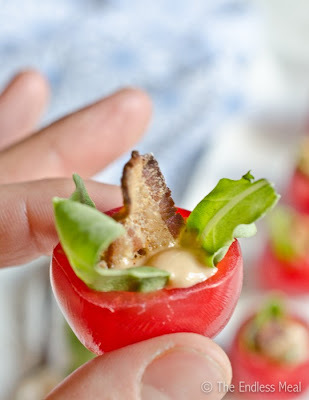 I just assumed that meant no yummy party appetizers this Sunday....but, I was totally wrong!! 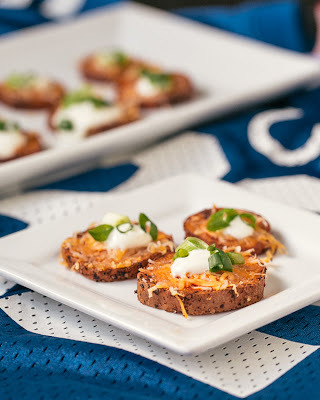 So this week I am sharing with you some scrumptious Super Bowl Party snacks that are lite and will also be a delightful surprise for your guests on Sunday night! Just shout, "Go, Fight, Win," while you enjoy tons of goodies that will keep you looking trim! 1. Combine all ingredients and puree in food processor or blender until smooth. Place in refrigerator to chill until ready to serve. Server with carrots and celery, top with additional Frank’s sauce and blue cheese. 1. In a medium bowl whisk together the room temperature egg yolk with the lemon juice and Dijon mustard. Slowly add the oil in a very small stream whisking contently. If the oil starts to build up and not become incorporated, stop pouring and whisk the aioli aggressively. Continue whisking and pouring the oil in slowly until it is completely incorporated. 2. Combine all other ingredients in a small blender. Add the aioli and blend until completely mixed and there are no visible chipotle seeds left. Salt to taste. TIP: If you are using store bought mayo, DO NOT put it in the blender as it will turn runny. Simply blend the chipotles, soy, miso and sugar together as best you can and then mix it into the mayo. It will not be as smooth but it will still be tasty. Do not use Miracle Whip as it will taste funny in this dish. 2. Stuff 1 piece of arugula (or other lettuce) into each tomato cup. Then place 1/2 teaspoon of bacon into each. 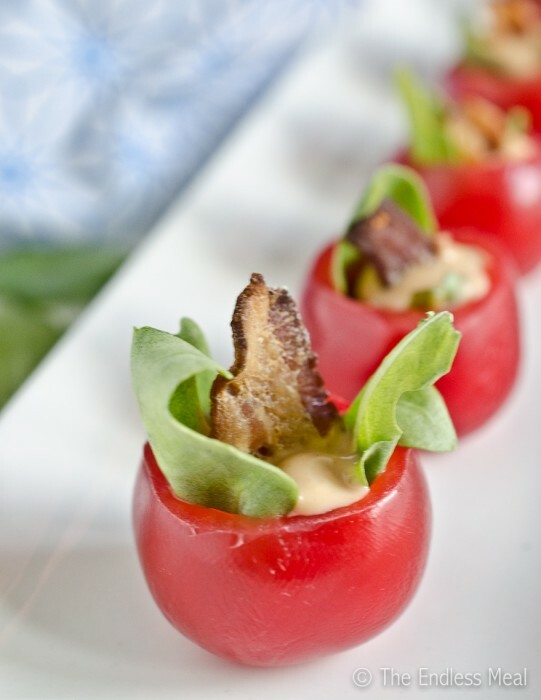 Top with a squeeze of chipotle aioli and a piece of bacon for garnish. 1. Preheat the oven to 450°F. Cut the sweet potatoes into 1/4 inch slices. Place the slices in a large bowl, sprinkle with 1-1 1/2 tablespoons of olive oil, 1 teaspoon of garlic powder, 1 teaspoon of chili powder, and 1 teaspoon of kosher salt, and stir to thoroughly coat both sides of all slices. 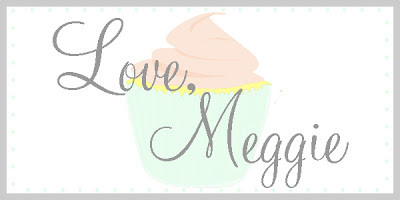 Place on a baking sheet lined with parchment paper (for easy cleanup). Bake 10 minutes on one side, then remove from the oven, flip all rounds, and bake another 10 minutes until soft. 2. While the potatoes bake, thinly slice the green onions (both the white and green parts). 3. When the potatoes are done, remove them from oven and add a dot of hot sauce on each round (or more, if you love heat). Top each round with shredded cheese and wait a few minutes for the cheese to melt (the potatoes will be hot enough at this point to melt the cheese). 4. To serve, place the rounds on a platter. Add a dollop of sour cream on each round, and garnish with sliced green onions. 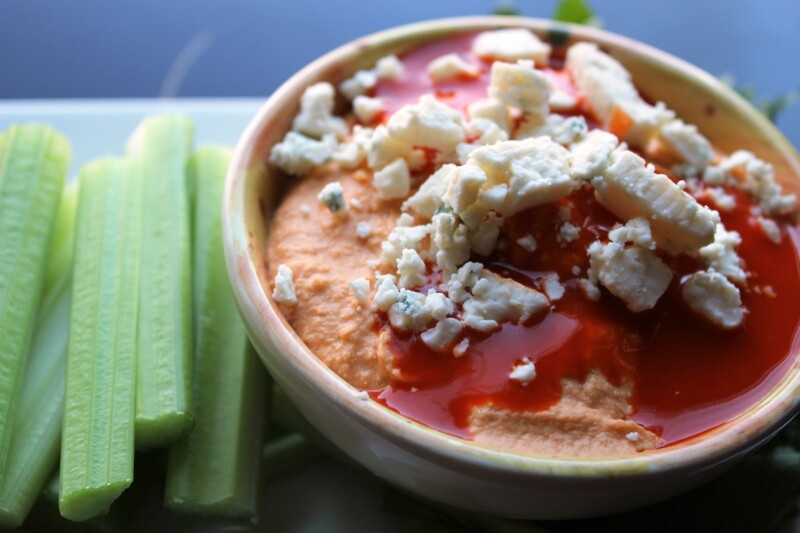 TIP: To make it easier to dollop, you can mix the sour cream in a bowl with a few drops of water to loosen it. 1. Cut cheese in half to give you 24 pieces. Place cheese in the freezer until cheese is frozen. 2. In small bowl, whisk the egg. Place the flour on another small dish. 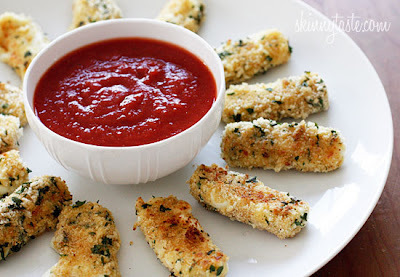 In separate bowl, combine bread crumbs, panko, parmesan cheese, and dried parsley. 3. 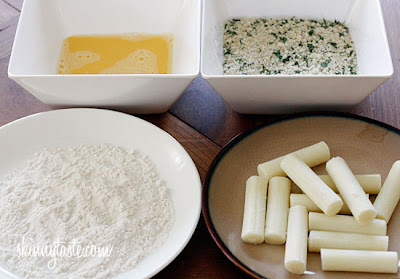 Dip the frozen sticks in flour, shaking off excess, then into the egg, then coat with the crumbs. 4. Repeat this process with the remaining cheese placing them on a tray with wax paper. Place cheese back into the freezer until ready to bake (this is a must or they will melt before the crumbs get golden). 5. When ready to bake preheat oven to 400° F. Line a baking sheet with aluminum foil and lightly spray with oil. 6. 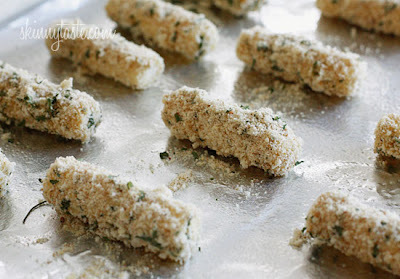 Place frozen cheese sticks on baking sheet. Spray the tops of the mozzarella sticks with a little more oil and bake in the bottom third of your oven until crisp, about 4 to 5 minutes. Turn and bake an additional 4 - 5 minutes watching them closely so they don't melt. 1. Preheat oven to 425 degrees. Place a cooling rack on top of a rimmed baking sheet. 2. Combine bacon, onions, cream cheese, mozzarella, and garlic powder in a small bowl. Season to taste with salt. Fold in shrimp. 3. In a small bowl whisk egg whites until they become frothy. 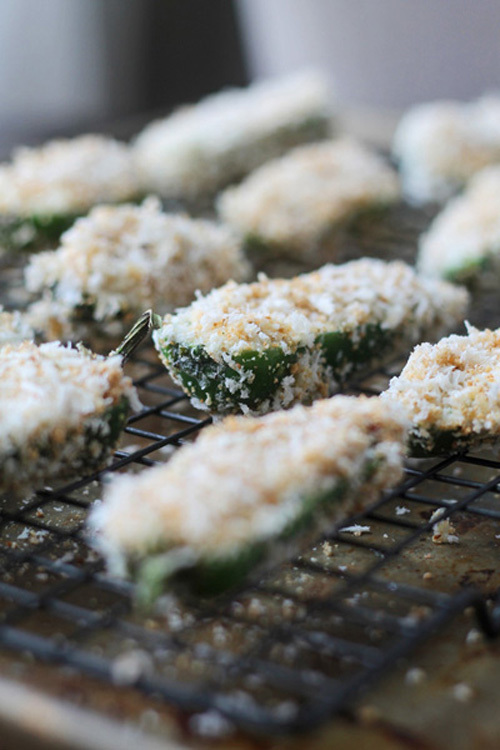 Combine panko and whole wheat bread crumbs in a small bowl. Season with salt and pepper. 4. 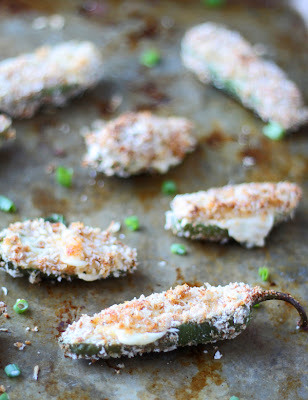 Fill each jalapeno with cream cheese mixture. Coat in egg white and then bread crumbs. Place breaded jalapenos on the cooling rack and then place in the freezer for 15 minutes. Once the poppers have chilled, drizzle with olive oil and then bake for 20-25 minutes until poppers are brown and cheese is oozing out. 1. Preheat oven to 425 degrees F. Line a baking sheet with parchment or foil. 2. Place the mushrooms on the baking sheet, stem side down. Spray lightly with cooking spray. Bake for 5 minutes. 3. Drain mushrooms on paper towels stem side down. Press paper towel over top. You may need to change paper towel more than once. If liquid appears in stem well, blot it out. Cool to room temperature. 4. Crumble the sausage in a sauté pan and cook until no longer pink and starting to brown. Drain on paper towel. Reserve. 5. Place mushrooms on paper towel covered work surface. 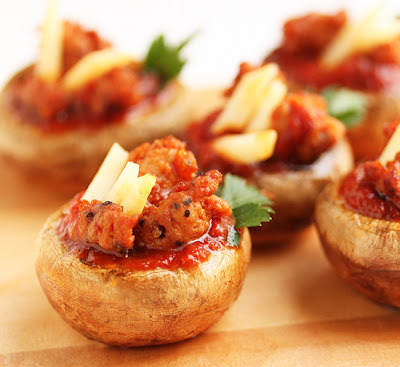 Fill mushroom with a small piece of Fontina, a little Parmesan, a couple teaspoons pizza sauce and some sausage. Sprinkle with a little Kosher salt. 6. 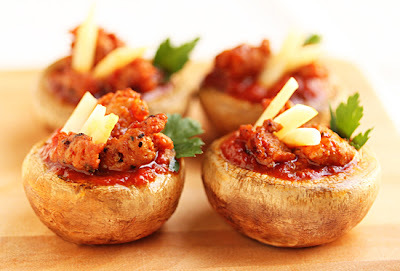 Microwave filled mushrooms on high for about 20 seconds until very warm. 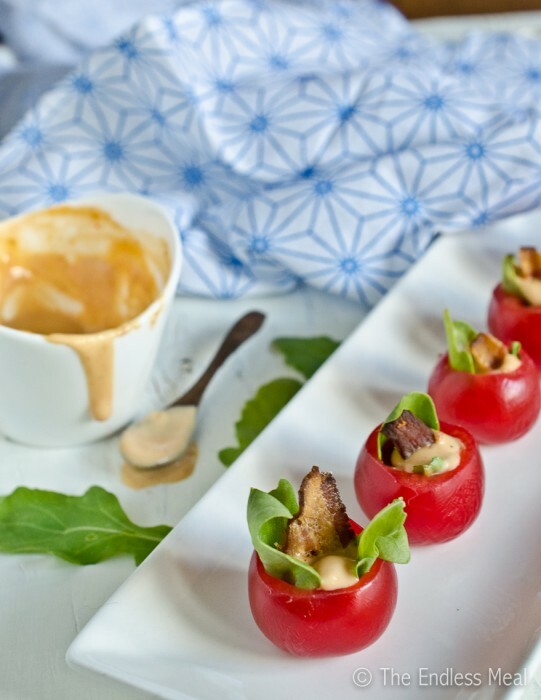 Garnish with mozzarella batons and parsley leaves. Serve very warm. 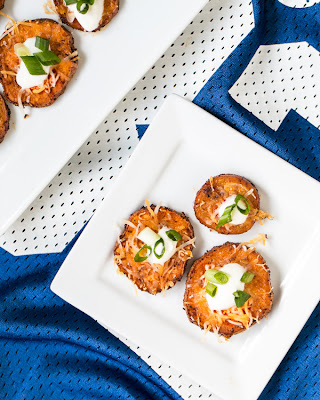 What could be better than eating snacks that keep your waist small while watching an exciting game of football? 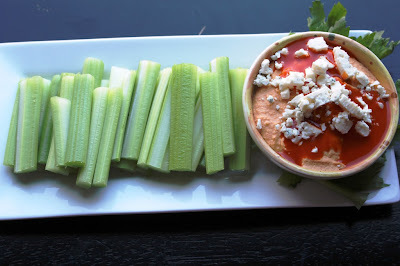 Picture how fabulous these skinny snacks would be served at your ladies only Super Bowl cocktail party, as a way to sneak some healthy goodies into the buffet at your husband's Super Bowl gathering, or even as a fabulous spread at your next Fantasy Football draft. So serve up some delicious skinny Super Bowl goodies that will delight...have your guests screaming, "TOUCHDOWN" with each bite! Have a great weekend! Great snack options! Thanks for including mine. I wish I liked mushrooms, those look delicious.